I stood mere feet from Dzhokhar Tsarnaev. I don’t mean the fateful day of the 2013 Boston Marathon; I had the good luck to be outside the city on that day. Or any time previously, although we apparently traveled in similar circles: he lived in Cambridge; I worked there and lived nearby for awhile. I had a friend at UMass Dartmouth, where he was going to college. I teach at the community college his brother attended, the college he probably would have gone to after flunking out of UMass Dartmouth, if circumstances had been different. I often think of the times I may have passed him on the street in Central Square over the years, just another mop-headed teen I never looked too closely at. I saw him yesterday, in person, in the courtroom. I have been needing to do this for two years. The reason is perhaps more simple than I thought. I have struggled to explain it every which way, often inciting bewilderment, exasperation or downright hostility. But what it comes down to is this: if you lock me inside my house and tell me someone out there is not only guilty of a heinous crime but so dangerous the entire city must cower in fear from him, then show me a clueless college student who, until that morning, was well-thought of and well-liked, I’m going to start asking questions. Doubly so if it is revealed he too was cowering all day, unarmed and bleeding, waiting for death in someone’s boat. Perhaps the most well-known photo of Dzhokhar Tsarnaev. Since then, I have come to know Dzhokhar in pictures: snapshots of his face capturing moments in time when, I suspect, the nightmare he both caused and continues to experience is completely unfathomable to him. The most famous, perhaps, a shot with a white background, his hair slightly defying gravity, his eyes unfocused and one bit of his narrow mouth upturned, as if amused by a private joke. I’ve seen others, of course, floating around the internet, remnants from social media, selfies of the most harmless order. And then comes the parade of chillers: in a white reversed baseball cap, a backpack slung over his shoulder, following his brother down a street I know so well, with no discernible expression. And later still: with blood carving canals down his face, hands up in feeble surrender, a red sniper dot on his forehead. For a long time, I thought this was the last I would see of Dzhokhar. I hoped the photos of his hospital recovery would eventually be released to the public (as of right now, they have not), but I learned that no cameras are allowed in federal court, and everything else I was likely to see was a court sketch, a hurried artist’s rendition, subjective and only partially accurate. I continued to follow the case for a slew of reasons; partly research for my novel, partly personal need. Because the truth is I predicted this, all of this, though the players are different and the plot is longer. The book series I have been writing for eight years echoes the terrible trajectory of Dzhokhar’s life, even though I started it in 2006, when I was 21, the age he is right now. How could I have done this? I have concluded is that it’s because he and I are not so different. I too was once 19 and volatile, but instead of taking out my frustration and restlessness and anger on the world, I built my own world to deal with it. That doesn’t mean I wasn’t capable of destruction. When I think back now it scares me, how I felt sometimes, how casually I contemplated violence. This tends to disturb anyone I admit it to, but it’s the truth. So vividly similar is this novel world I built to the one I found the Tsarnaev brothers must have inhabited, I was able to create a character based on them and insert him into my storyline with minimal fuss. No, the fuss was not caused by the presence of this character – and ten days after the bombing, I knew it was inevitable and was already writing – but the fact that I suddenly had a developing precedent on which to base the rest of my series. What was once fiction inside my own head became historical fact. I’ve had to trace everything back and back, before the Marathon Bombing, to root causes of terrorism, American policy after 9/11 and so on, weigh my findings, make adjustments and best guesses based on the available information. I’m constantly worried I’m probably on an NSA watch list based on my Google searches and Amazon purchases. I wanted to know how Dzhokhar’s trial played out because it would, inevitably, alter the course of my own writing. 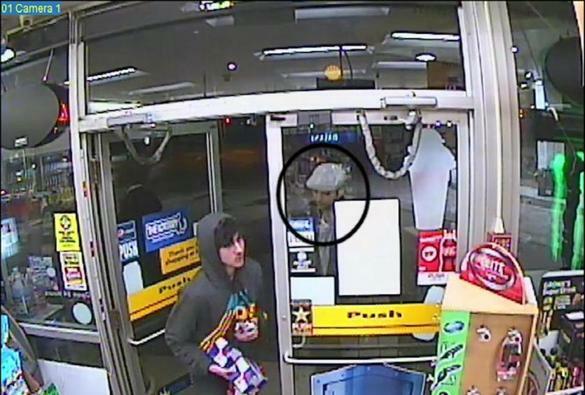 Dzhokhar returning a cache of Red Bull and chips to a convenience store clerk while Tamerlan (circled) stands outside. I knew that conviction on some of the thirty charges would be inevitable. The defense, in their opening statements, admitted, “It was him.” But there is still so much I wonder about. No fingerprints on the bomb materials or tools matched anyone but Tamerlan. Components purchased where either in Tamerlan’s name or in cash at one location when cell phone data put Dzhokhar at UMass Dartmouth. Footage of the shooting of MIT officer Sean Collier was inconclusive; the gun that killed him always in Tamerlan’s possession the night of their botched escape attempt, April 18, 2013. Witness testimony from Dun Meng, the carjacking victim, did not place Dzhokhar physically at the scene at the time of the carjacking; he got in the car a good twenty minutes later. There was the odd moment of conscience displayed amid panic in refusing to shoplift the snacks. Also, Dzhokhar participated in the shootout on a residential Watertown street, but it was initiated by Tamerlan and hundreds of shots were being fired back at them by the ever-increasing police presence. I found myself wondering – in the event that he had tried to surrender, what were the odds the police wouldn’t have simply killed him anyway? The recent attention given to the phenomenon of police killings suggests probably not, as does the murder of Tamerlan’s friend Ibragim Todashev by a Boston FBI agent. Additionally, apparently as soon as Dzhokhar seemed to be out of ammo and abandoned by his brother – police testimony stated that Tamerlan stepped off the road to engage in gunfire with an officer, taking seven shots – he attempted to remove himself from the scene, in the stolen SUV that he’d been using as a shield. None of these facts does a fully willing accomplice make, no matter what way I look at it. I hoped an impartial jury would have to convict on some of the charges, particularly the crimes he had a specific hand in committing, and the others wouldn’t stick. When the verdict was reached on April 8, after only eleven hours for thirty charges, I was scared. I stayed on the phone with my dad and read off each count as it came in. I found myself repeating “guilty” until it ceased to sound like a word, my voice growing thinner each time. Five times. Ten. Fifteen. By nineteen I had started to cry: bitter, angry tears, not in response to the verdict, but at myself for thinking it could have possibly gone any other way. For weeks I had weighed the facts and evidence, had tried to give Dzhokhar back the presumption of innocence that had been taken from him, and made my own deliberations in the face of new information. After two years of bracing for a smoking gun, some scrap of evidence that Dzhokhar was as complicit and willing in the crimes as Tamerlan, I’d gone in the opposite direction and decided that he was even less involved than I’d thought. And yet, all thirty charges, all sub-counts, everything – guilty, guilty, guilty. Terrorists, it seems, do have to pay for the sins of their brothers. Yesterday, April 21, the day after the 2015 Boston Marathon, the penalty phase of the trial began. Now, the question becomes: should Dzhokhar die for what he’s done? The prosecution, going first, says yes. And yesterday, I took the T downtown, and walked across the bridge over the harbor, to the federal courthouse. Armed with a backpack – of which I’ve grown self-conscious – I walked up to the giant brick facade, past police guards and bomb-sniffing dogs, by hordes of media camera crews. I hesitated by the front door, petrified. Afraid of looking suspicious, I didn’t linger. I scurried into the Starbucks placed mercifully next door to compose myself. I ordered an iced latte and sat in the window, watching the police patrols, media, and lawyers mill around. A cop with an assault rifle got into his SUV and played with his phone, bored. If they’ve thought Dzhokhar might make a run or swim for freedom, so far they’ve been disappointed. Getting inside the federal courthouse is both easier and harder than it looks, especially with a row of camera crews watching. I followed the goings-on in the courtroom via live tweet, waiting for the hour-long lunch recess to start at one p.m., thinking this would give me enough time to find the right room, despite being completely blind to the layout of the courthouse. When the clock struck one, I worked up the courage to stroll past the cameras, through the front door. I was required to surrender my electronics – goodbye, cell phone and laptop – and go through a metal detector. No one cared why I was there. Feeling naked and lost without my iPhone, I wandered upstairs. I milled about a cafe, saw a Boston Globe journalist I thought I recognized, and tried to find a building directory. There wasn’t one. Finally, I took a guess and jumped into an elevator. Mercifully, the elevator listed what courtroom was on what floor. I knew I needed Courtroom 9, a detail I had gleaned from an article weeks before and repeated to myself, with the knowledge I could show up if I wanted to. And yesterday, I wanted to. After two years of piecing a life together from pictures, surveillance videos, court sketches, written descriptions and my own imagination, I needed to see him, just once. Journalists have claimed he maintains a flat, remorseless expression, exhibits a tendency to keep his head down and not look closely at the jury or witnesses. I needed to see for myself. Courtroom 9 is not, strictly speaking, open to the public, for obvious reasons. 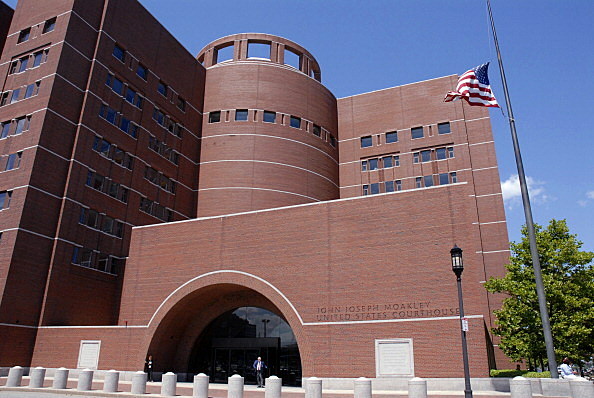 It sits at the end of a long hall of paned glass overlooking the harbor, and the two adjacent courtrooms are used for media spillover. There is a table set up with court clerks standing guard – very nice ones, might I add. They were happy to add me to the public waiting list, although they couldn’t guarantee me a seat in the courtroom. I showed my ID and wrote my name, maybe seven or eight spaces down. Not a lot of people want to come spectate something like this. After spending much of my twenties in line for bands with rabid fans, this was a strange change of pace. I was told I was welcome to wait out the recess and then they’d call names to see if there was room for me. The clerk asked me if I was a journalist or a lawyer. I said I was a writer, doing research for a book. Then I sat on a bench next to a woman I assumed was a journalist, clacking away furiously on her laptop. I snuck a glance at her screen. Next to a page of text was the standard photo of Dzhokhar. A man appeared out of the media spillover room and together they debated the exact wording of a line from the prosecution’s opening statement: had Dzhokhar been determined to be America’s worst nightmare, or determined and destined? I almost added, Seems a bit overwrought, doesn’t it? but kept my mouth shut. There’s a reason I never went into journalism. Dzhokhar’s lawyers Judy Clarke and Miriam Conrad walked by, in deep conversation. I recognized them immediately from photos and court sketches. This was around the time I wondered if I was dreaming. I had an urge to dart up and follow them, to tell them: I think you’re doing very important work. Around two p.m., I was asked, along with a handful of other public spectators – all women, but of a large spectrum of ages – to stand and wait in line while they got things settled in the courtroom. I stood and watched another Boston Globe journalist pace and talk on her cell phone in urgent, hushed tones, one hand covering her mouth. The court clerks called names, and the women in line ahead of me walked by the table, one by one, and into the courtroom at the end of the hall. Soon I was standing alone, my arms crossed, trying to remember what breathing was. The clerk told me they had room for five people, and I was the sixth. I was about to thank them anyway and make my way to the public overspill room, when the clerk said he would check one more time – there might be space for one last person. A minute or so later he emerged from the courtroom and beckoned me inside. One thing TV and movies usually get wrong about courtrooms: they are not very big. This one, despite being for such a famous case, only had about seven or eight rows of benches. I was directed to the right side, about four rows down, and instructed to sit in the middle of the bench. I did, and tried to get my bearings. There were no windows. There were decorative decals on the while walls, arches of what looked like ivy. The judge bench was in the front, the witness stand in front of me, the jury to the left. Also more or less directly in front of me, I saw Judy Clarke talking to someone with a mass of brown hair long enough to brush his or her collar. I thought for nearly a full minute it was Miriam Conrad until he turned his head and I saw his face in profile. Then I recognized the prominent nose and the scruffy tuft of chin beard from the court sketches. 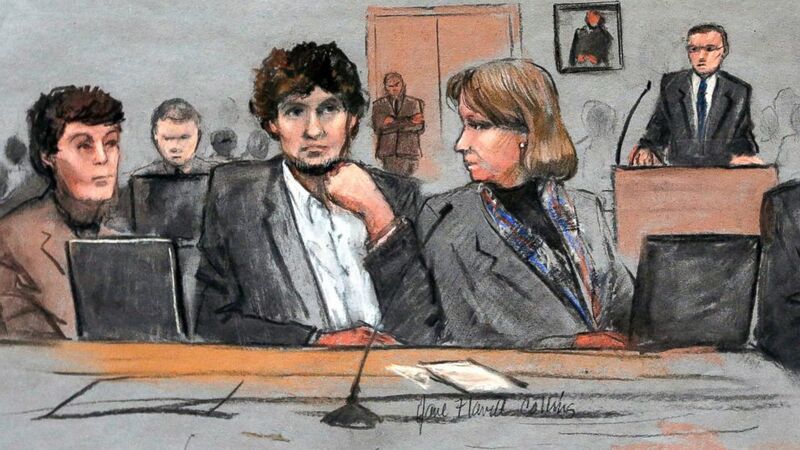 I’d been staring at Dzhokhar and not even realized. Sketches don’t really do any of it justice. Pun intended. He never turned around, so I never saw his face straight on, but I studied as much as I could. On some accounts the journalists are right – he tends to fidget, move around in his seat, head cocked at an angle, rubbing at his facial hair. He chats with his lawyers, and on those moments he looks like anyone else. On other counts, I disagree. Some have said he looks older, but he doesn’t, not to me. He still looks around the same age as the last published photos of him, although scruffier and perhaps a bit thinner. He’s awkward – when standing he nearly knocked over his chair and had to grab at it with both hands. He’s taller than I expected, but then I’m short and everyone looks tall to me. When I couldn’t get a good look at Dzhokhar, I looked at the jury. From what I could tell, all of them are white. I saw two men who looked as though they were under forty. Everyone else was probably fifty or older, and none of them looked happy. I would not classify this as a jury of Dzhokhar’s peers, but after two months of jury selection and four denied motions for a change of venue, I figured this is what you got. At this stage, testimony is not really going over anything we didn’t already know about the case. The prosecution is arguing aggravating factors, for why Dzhokhar deserves to die, and the defense will probably start next week and go over mitigating factors, why he deserves life in prison without parole. I listened to an hour and a half of grieving family members and bombing survivors and understood why people claim Dzhokhar looks so expressionless. Although the witnesses are emotional and their stories tragic, the lines of questioning can be tedious. I learned minutiae about Krystle Campbell’s life, her daily routine, how long her parents have been married, that she planned a lot of parties. I heard from another survivor about her idyllic day and her choice to find her sister at the Marathon finish line at the wrong time, her injuries, her treatment, her recovery. These stories are, though sad, largely the same, and nothing different from what I’ve heard while following the rest of the trial. I can see how, as the defendant, it can be easy to shut yourself off from them – partially because if you become affected, you will be displaying emotion to a room that will judge you for it, and partially because you were not the direct cause of them. All the witnesses from yesterday testified about the injuries from the first blast site, the bomb that Tamerlan set. Sit in a room for six weeks and listen to the same testimony over and over about many things you didn’t physically do yourself and I suspect even Mother Teresa might appear bored. I know I did, and I was there for under two hours. Court adjourned early, around 3:30. As we rose, I stood on my tip-toes to see over the crowd and stared at the back of Dzhokhar’s head. Look at me, I willed, although I knew he wouldn’t. Why look back at a room of your accusers? I don’t even know what I would’ve done if he had. Given him a smile, a sign that whatever his role in this tragedy, I’ve forgiven him long ago, that now I’m rooting for him and hope he’ll have strength? I doubt one look could get all that across, even though I would like it to. As court was dismissed, Dzhokhar darted quickly out of the courtroom, and I got my best look at him. It was fast, but unmistakeable: his head was lowered, to shield his expression from the crowd, but I still saw it. And I can say with absolute certainty that he doesn’t look like America’s worst nightmare. He simply looks very young, and very tired. I still have many questions about this case, but that much I can understand. It is my sincerest hope that however and whenever this ends, he can find some peace. I’m one of those who still believe the Tsarnaev brothers were framed or set up to be patsies. Needless to say, I’m disappointed at the puzzling tactics of Conrad & Co. I have been grieving for Dzhokhar ever since the trial began. Strangely, although I have lost a lot of sleep, I did not cry until I read your article. Something about it released my tears. Thank you. You’re very welcome. I’m glad I could bring you some catharsis. I too have had many sleepless nights since this all happened and it means a lot to me that I’m not alone. Although I’m not a lawyer myself, my father did criminal defense for many years and he and I discussed the defense’s strategy at length. You might be heartened to hear that he believes there are tremendous grounds for appeal because the defense was blocked from bringing its strongest case (among other factors). It’s a bit complicated to explain, so I’m hoping to do another post on it soon. Yet more light in the darkness, written with genuine humanity and insight – from a defense attorney’s daughter. Thank you so much for the reblog, as well as your kind words. You deserve the gratitude for this humane and decent perspective. Believe me, it’s like water in the desert. I look forward to your posting on the grounds for an appeal. Thank u for your story and your strength to attend the trial.as I was reading it, it seemed I was there with u..share the same feelings and thoughts . You’re very welcome and thank you for taking the time to say so. I think this is one of those things we need to experience collectively, lest we forget what makes us human. Nicely written article, Thank You! Thanks for your story! Certain parts of it were as if you were reading my mind. I agree that Jahar should not be carrying the blame for certain things his brother was responsible for. He was casually involved towards the end and I’m sure he will think about that for the rest of his life. He seemed to be inexperienced at making good choices and why he decided to follow this path we may never know. But, scary terrorist with the worst of intentions, I don’t think that describes who is is/was. I wish he had a chance to rethink this whole senario. I wish someone who he looked up to outside the family would have been closer to him and he could have confided in them. It’s a terrible shame. I see nothing but hate for him. I understand the hurt and pain. I feel it’s displaced and too much. If they wanted Jahar to die for his sins, why not kill him that fateful night? Why save his life only to drag him through this crazy trail only to punish him again. I don’t get it. Our species is soo cruel. I hope he comes through this somehow, God willing and maybe finds peace, also in someway. Is that enough to punish an otherwise decent young man for the rest of his life? … I simply don’t believe that is true justice. It feels wrong down to my very bones. Thank you for this. Right from the beginning, two years ago I have had the feeling there was something off about the official narrative and there is so much more to this story. I have gotten to the point of thinking, as I am doing mundane daily tasks, Jahar will never have the opportunity to do what I am doing at this very moment, and it saddens me immensely. I don’t know why but I have this unexplainable pull towards him and it confuses and confounds me. I look forward to reading about your insight about the defense strategy as at this point it doesn’t make sense, I feel they didn’t even try. They had some sort of evidence that they were not allowed to present to the jury at the end of the trail and the case was very one sided. If the prosecution was so confident that they had the right person, why not lay everything out on the table? So many questions that we will probably never get the answers to. The prosecution won at the expense of this young man. I can’t help but think he’s somehow innocent in some way. Sorry, world. You may be more correct than you realize. I absolutely believe he was acting under duress but the defense was barred from saying so due to a number of unconstitutional reasons. My next planned post is going to go into why.